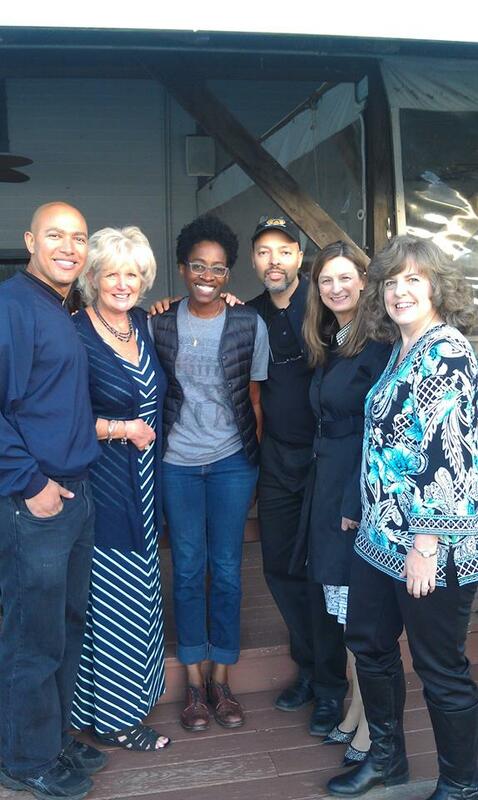 This past week held a wonderful surprise for both Emily and I. 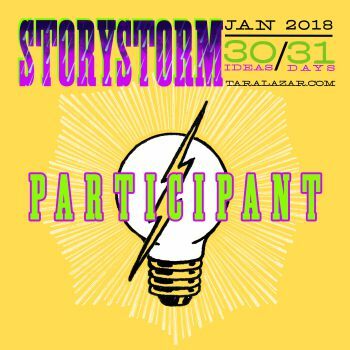 As you know if you have been following my blog, we've been spending time practicing our recipes for the 16th Annual Chocolate Lovers Bake Off sponsored by our local library. 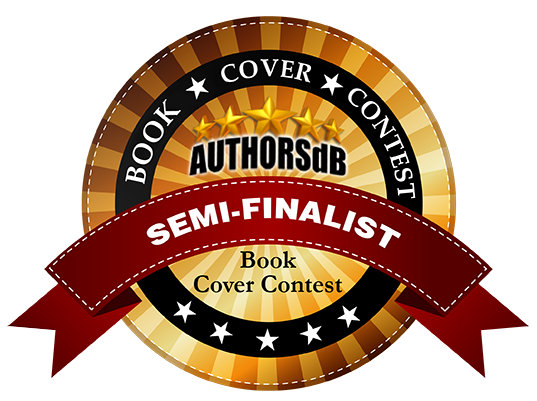 So with breath held and hopes high, this past Monday we took our entries and waited as the judges sampled all the offerings. 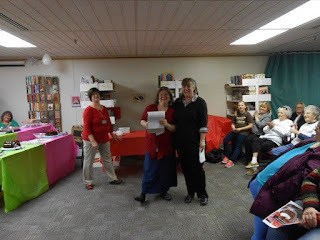 They judged the children's table first and to our great joy we heard them call Emily's name as first place winner for her strawberry filled chocolate cupcakes with chocolate buttercream frosting. Before hand I reminded Emily that win or lose we both had a wonderful time baking together and that was what was important. But I would be lying if I said my heart didn't thump with delight at the sound of her name being pronounced as winner. Next they announced the winner of the cookie table, and I won second place for my chocolate chocolate chunk cookies. I was pleased, but it was nothing compared to the happiness I felt for my offspring. Next they announced the winners from the dessert table which I had not entered. Following was to come the cake entries, and after looking at all the beautiful cakes, I was fairly sure I was not going to win anything for my chocolate peanut butter cup cupcakes. 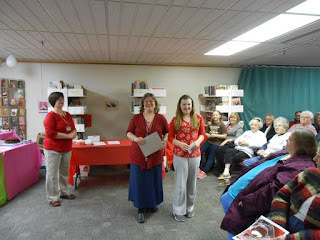 So, you can imagine my surprise when I was announced as the first place winner of cakes. The rest of the week passed in the normal manner with home school lessons completed, choir practice for Emily, house cleaning, and time spent enjoying the numerous squirrels frolicking in our yard. I love squirrels with their wiggly tails and cute faces. Even when they try to climb my shepherd's hook to steal bird seed from the feeders, I can't help but laugh at their antics. 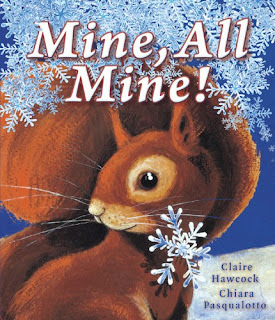 So out of the pile on my bookshelf, I snagged a book about squirrels which had caught my eye at the library due to it's beautiful cover. It was called Mine, All Mine and the title suggested there just might be a lesson in there somewhere. Of course there was a lesson about sharing, but it was told subtly and there was even a glittery snowflake to follow. A perfect book for four to eight year old children to take in; and if they are like me, they will definitely take time to feel that glittery snowflake on every page too! 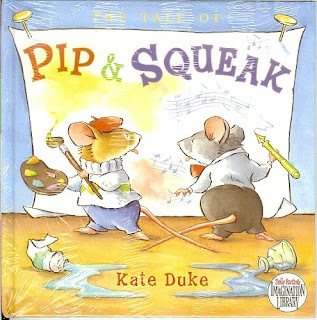 I also read The Tale of Pip and Squeak which happened to be another book about sharing. This was totally coincidental of course, but worked out perfectly. Pip and Squeak are brothers who don't really like to be in the same room and don't really like to share the spotlight. But one day that all changes and they realize it's okay to work together and share the admiration of those around. This is an older book, but it is worth seeing if your library has a copy or searching for a used copy as it was considered good enough to be added to the Dolly Parton Imagination Library. And since all these books happen to be about sharing, I would feel totally remiss if I didn't share the recipe for Emily's award winning cupcakes with you. So here it is and I hope you enjoy. Preheat oven to 350 degrees and line two muffin tins with paper liners. Stir together dry ingredients in bowl and set aside. In a stand mixer, beat sugar, oil, eggs and milk until smooth. Add dry ingredients and mix thoroughly for about two minutes. Stir in boiling water. (Batter will be thin) Pour batter into tins filling about 2/3 full. There will be some leftover batter as this recipe makes about thirty cupcakes. Bake about twenty minutes and check centers to see if toothpick comes out cleanly. Remove from pan and cool on racks. 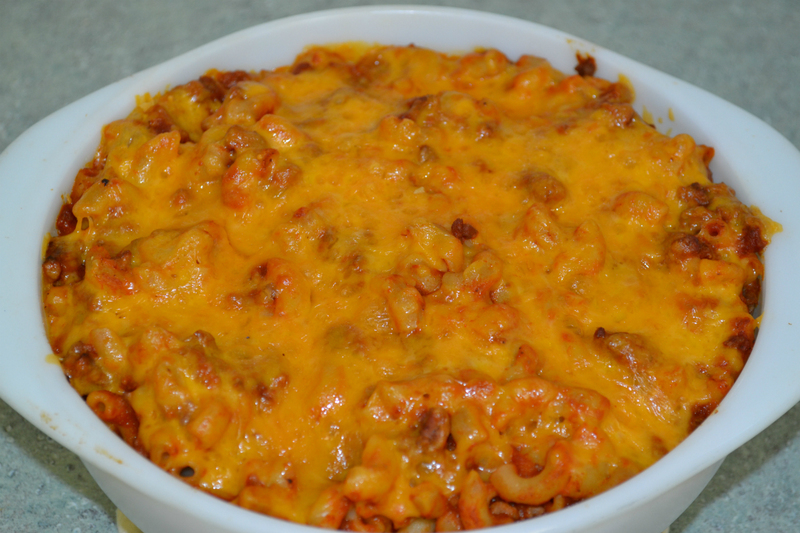 In a pan combine all ingredients and cook over medium heat stirring frequently. Mixture will begin to thicken like jelly. When it gets to this point, remove from heat and allow to cool. Core cupcakes (we used an apple corer) and fill with cooled strawberry mixture. In stand mixer, add five cups of powdered sugar and cocoa and beat on low until combined. Add butter, vanilla, and one TBS of milk and beat. Continue to add milk one tablespoon at a time until desired consistency is reached. If frosting is too thin, add additional powdered sugar. Frost cupcakes and enjoy! For those of you who are familiar with Ohio weather in February, you know it is usually cold, snowy, and extremely dreary. But this past week we have had an uncommonly mild week. So mild in fact, that on Saturday it was almost seventy. That also happened to be the day of the Richland Public Health Department's Winter Walk for Health. They were sponsoring the walk at three separate locations and we chose to walk at Malabar Farms the former home of Louis Bromfield. We walked the one mile Doris Duke Trail and had the unexpected pleasure of being the only hikers on that particular trail. We took our time. We took pictures. We enjoyed nature and each other. 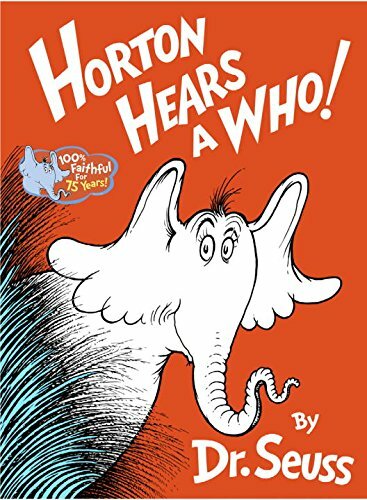 And quite possible, Emily heard a Who. We had an uncommonly good time on our uncommonly warm February walk. And it just so happens, that I also read an uncommonly good book as well. 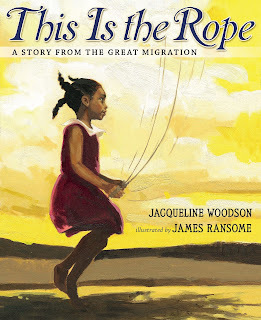 A book titled This Is The Rope by Jacqueline Woodson. 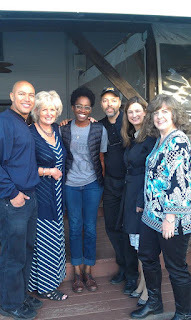 I had the pleasure of meeting Miss Woodson last May at the Hudson Children's Book Festival, and I wish I had read this book previously so I could have told her how much I enjoyed it. It is the story of one family's migration from South Carolina to New York and a piece of old rope that ties the generations together. Ms. Woodson expertly weaves a tale of the many uses of the piece of rope, a tale that starts with a new mother and ends when that same woman is a grandmother. 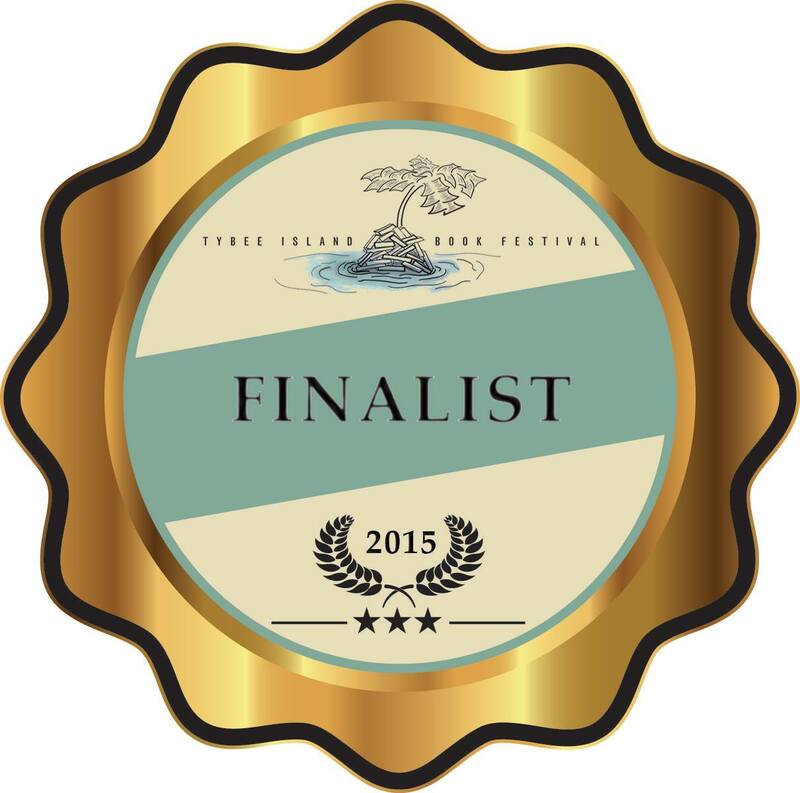 It is a story I heartily recommend for children of all ages. Life is like the tide with ebb and flow. Some weeks are restful with not much going on and others are chock full of busy and interesting events. This past week was one of those busy weeks. Emily attended not one, but two pizza birthday parties. We also attended Cook Book Club where the theme was casseroles. She chose to make our family's version of goulash and I made bread pudding out of a box of stale yeast donuts. I wasn't sure how well bread pudding would go across, but much to my surprise, the dish was empty when I went to retrieve it. 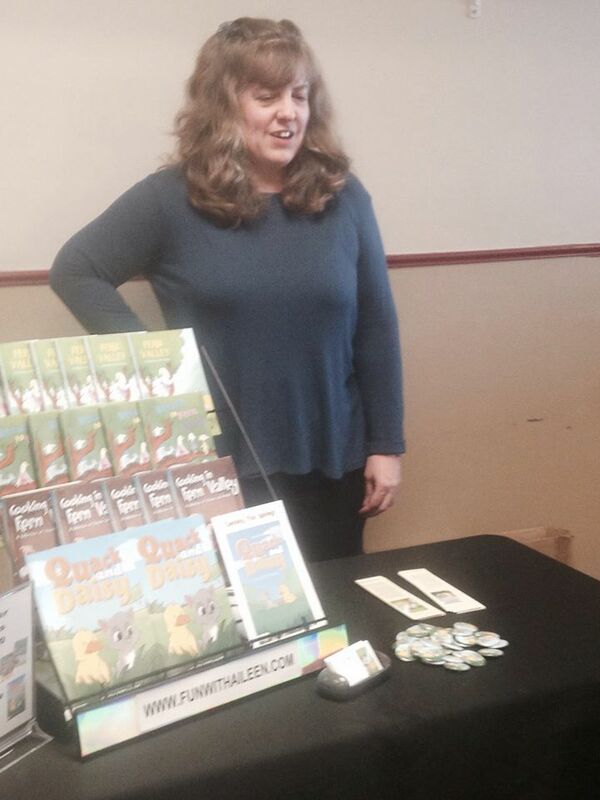 In addition, I had a book signing at a local store downtown. My friend Connie, who owns the local Avon store Connie's Place, hosted a children's day resplendent with balloons, face painting, and a cookie decorating station run by Emily. While the children waited their turn to have their faces painted, I read to them from Quack and Daisy. During our school week, we started a new unit in Social Studies about going West. Emily was pretty excited about the fact that I found a fun online game called Wetward Trail for her to play. 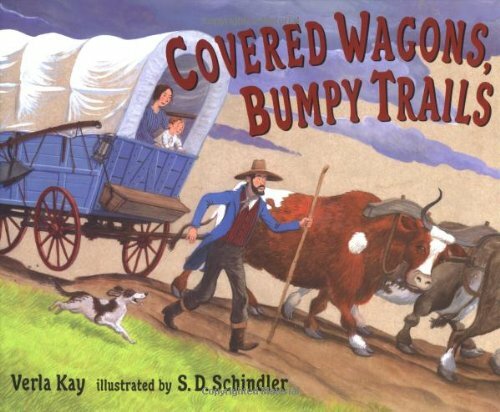 So it only seemed appropriate to read a book from my library pile called Covered Wagons, Bumpy Trails by the esteemed blue board creator at the SCBWI, Verla Kay. 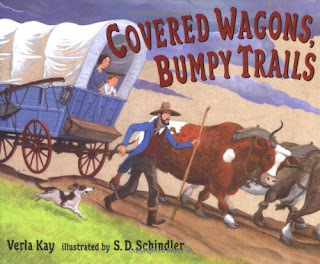 Told in beautifully flowing rhyme, the story follows a family of three on their long journey west. Through hardships including foul weather, rocky mountains, and parched land, they forged on until they found their own promise land. Although this book is over fifteen years old, it is well worth the search. 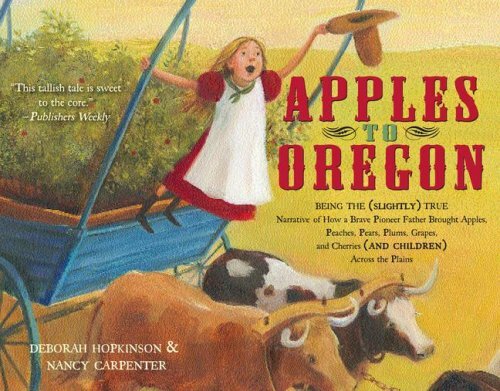 Another great book about traveling west is a book titled, Apples To Oregon - Being the (Slightly) True Narrative of How a Brave Pioneer Father Brought Apples, Peaches, Plums, Grapes, and Cherries (and Children) Across the Plains, that I reviewed two years ago. 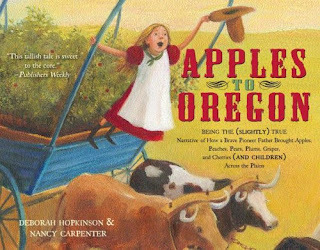 Apples to Oregon is a terribly funny story of the pioneers traveling there and the cargo they brought. Even the title is funny claiming to be slightly true. So if you want a bit of history told in a fun manner, you really need to check out this realistic fictional piece! 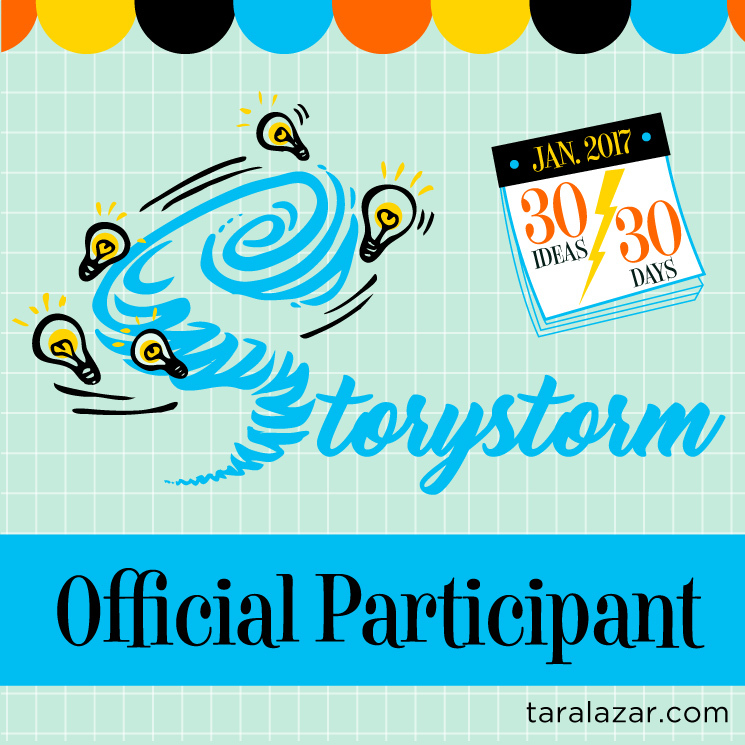 It's Time For The Valentiny Contest. 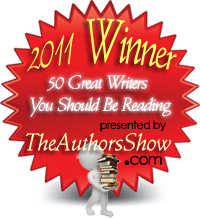 Kudos to the lovely and talented Susanna Leonard Hill and her most excellent contests for writers. 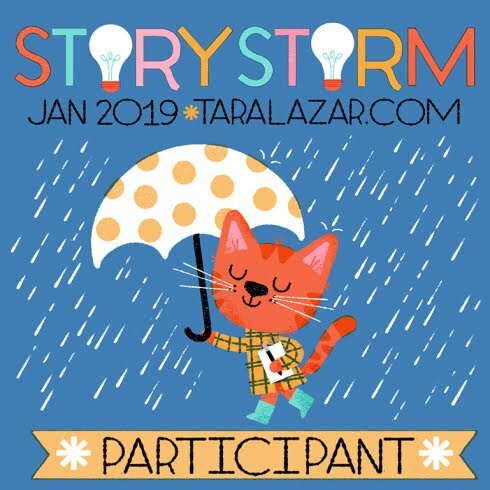 This week she is hosting the Valentiny Contest where each participant has been instructed to write a valentine story for children under the age of twelve in 214 words or less. And believe it or not, my word count came out to 214 exactly! So as instructed, here is my entry for the contest. I hope you all enjoy. Grumpy Bear hammered ferociously and stepped back to look at his progress. He didn’t smile, but he did look satisfied with the sign he had just nailed to his fence. It read__ KEEP OUT! Grumpy Bear, whose real name was Harold, hadn’t always been grumpy. At one time he had been cheerful. That was, until his true love Genevieve moved away. Her father had been offered a job beyond the mountain and that was the last Harold ever saw her. As days passed, he became grumpier and grumpier. He became so grumpy that even the mail man tried to avoid him, which wasn’t difficult since he never received any mail. But one day that changed. The mailman stared in amazement at a pretty pink envelope smelling of roses. It was addressed to Harold. The astounded mailman slowly walked to the gate and held it out. Harold was equally surprised. Gently, he pulled out a heart shaped Valentine. It was signed__Your Secret Admirer. Harold blinked and looked around. Just then he saw Genevieve walking down the street. She told him she was the new teacher and would be living just around the corner. Harold’s face lit up with a smile that went from ear to ear. After that, no one ever called him Grumpy again.